Hayduke has a pretty good life. That little stray puppy huddled in the tree roots, hungry and scared, has made a fine life for himself in the house across the street. He gets good dog food and an endless supply of toys and treats and belly scratches and long hikes in the woods. It's his first winter here, and even though he sleeps inside at night, he needs a doghouse for the cold mornings and evenings he stays outside during the winter, or during the rainy parts of the year. But will any old doghouse do? No, it will not. 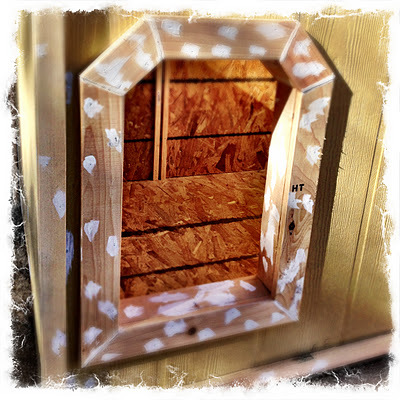 No doghouses we can buy locally are insulated. No doghouses we can order online review well. 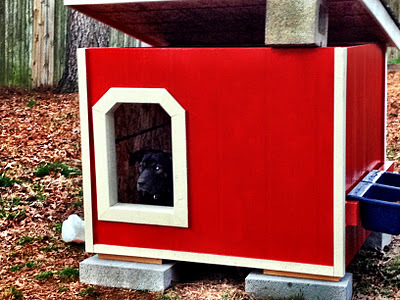 Most dogs in Arkansas do just fine with a non-insulated doghouse. Most dogs don't read online reviews. 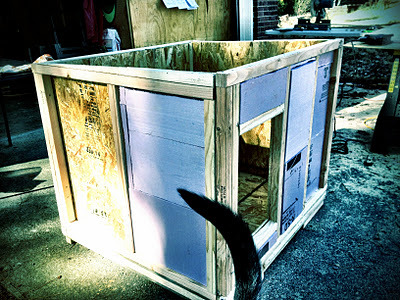 We're BUILDING a doghouse. We ordered plans online from doghouseplans.com and gathered ideas from reviewing hundreds of doghouse photos. We've gone to Home Depot a half dozen times. 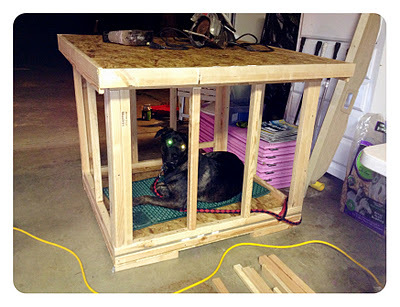 We've spent good money and large parts of four days building this doghouse. We've also gone to a great deal of trouble to involve Hayduke in its construction. He's been next to the driveway all week, personally sniffing each handful of nails. 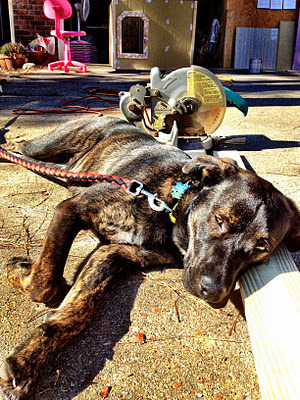 He's been lying on random doghouse-parts. He's shoved his big head between the hammer and the nail a number of times, and construction has halted abruptly so that he could render his opinion. We've somehow become even more particular as the thing took shape. We've got so much invested in it at this point that we want it to be perfect. It's somehow become a strange metaphor for all that's right about dog ownership. Or, possibly, for all that's wrong about it. We're putting putty in the nail holes and priming the heads of all the nails so that they won't rust. It's really a little silly, the trouble we're going through to build this house. It's huge, and monstrously solid and heavy. At some point we began calling it 'the dog barn'. It became clear that red would be the only appropriate paint color. Hayduke approves. We know this because his ears are now the same color as the dog barn. Red. 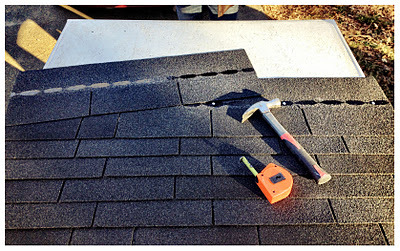 Neither Bryan nor I has ever actually put a roof on anything, but we've helped our fathers with roofing projects. Between us, we figured out how to do it, but I think our pattern overlapped too much. Bryan put a whole pack of shingles on the roof while I finished painting the barn. We added a bracket on the side so that we could mount some horse feeders for Hayduke's food and water. We had to borrow a dolly and have several friends help move the barn into the backyard. It's freaking huge. A monstrous dog barn. Mandy was off school for another week, so she spent a couple of hours in the dog barn each afternoon, with a book and meat snacks, just to be sure he understood that the dog barn is where the cool kids hang out. But I think it was worth it. It's perfect. It's a perfect dog barn. Hayduke's dog barn.